I adopted Cher in 2011. At that moment in my life I was going thru a horrible time. Cher brought me out of my shell and I started living life again. I took her everywhere with me. We became very well known at the local gun shows in the DFW area. Not to long after I adopted her she was diagnosed with MMM. 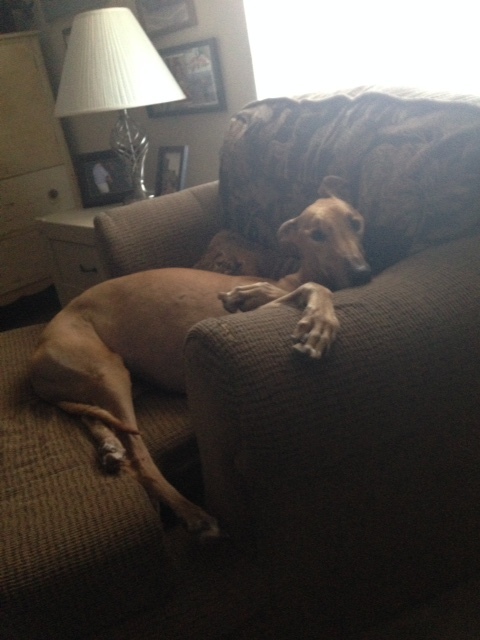 MMM is an auto immune disorder and is rare in greyhounds. Dr. Porterpan was the one that diagnosed Cher and saved her life. In 2016 her left rear digit was amputated due to a non cancerous tumor. 1-6-2018 she was rushed to Metro West in Fort Worth. X-rays showed tumors on her rib cage and near her spine. She lost her fight that night. If it wasn't for Dr Porterpan, Marci, and Leann I wouldn't have had 7 wonderful years with her. She truly saved me when I needed it most. There are not words for how much I miss her and how much I love her. I couldn't have asked for a better companion. I love you Cher.